If you were given £200 to spend on whatever your heart desired, what would you buy? This was the question posed to me by E.ON recently. Lots of options entered my head - new clothes, a new camera lens, a weekend away, a spa day.....with £200 to spend, there are so many options available! The Ofgem national average UK household could save up to £200 by switching energy suppliers so I decided to put this to the test and compared gas and electricity tariffs with E.ON to my current supplier. This online tariff comparison tool is super straightforward to use and you don't need to sign up for anything to find out how much you'd save. It turns out I'd save £120 per year by switching to E.ON which is not to be sniffed at! After giving it some thought, I decided I'd spend the £120 I'd save by switching energy suppliers on a family day out to a UK theme park next summer. After our holiday to Florida this summer, both Harry and Heidi were really taken with the thrilling rides and have yet to experience the white-knuckle rides that the UK has to offer too. They've been nagging me non-stop to visit another theme park and I think if I don't plan a big trip this summer I'll be in serious trouble! 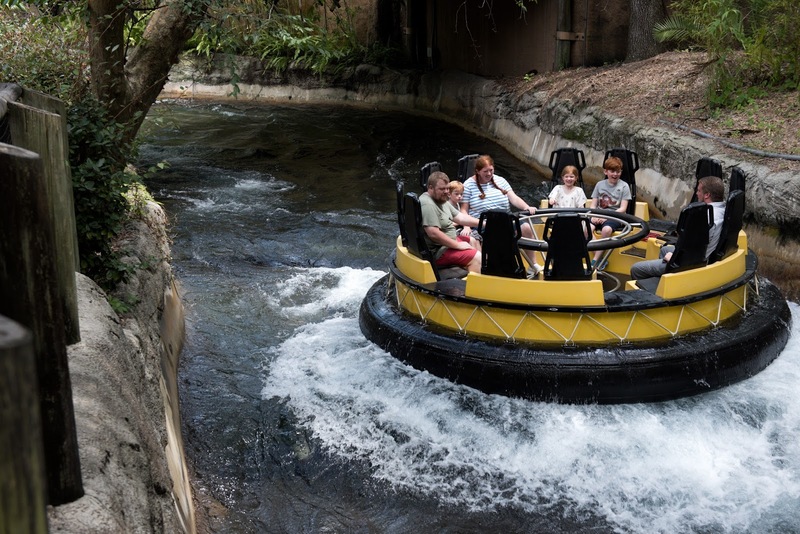 We all loved the river congos at Busch Gardens and would love to find a UK park with this kind of ride so we can relive the experience - we had SO many laughs on this ride and it's a memory we'll all treasure forever. I would love to hear if you have any recommendations for UK theme parks with thrilling rides that the whole family can join in with like this? I'm thinking it will probably be Alton Towers we visit but I'm open to ideas. Theme Parks are notoriously an expensive day out and definitely the kind of thing you keep as a treat rather than an everyday experience and I think £120 would just about cover our entry to a park at the beginning of the school holidays as an end of term treat and would be something the whole family would look forward to before Harry starts High School in September and will no doubt want to start doing this kind of thing with his mates rather than his family. If theme parks don't tickle your fancy, you can check out a few other suggestions by other UK bloggers here. I love that Lindsay would save the money for her wedding, Helena would buy a flight to Spain to visit her mum and Jen would treat her family to more trips to the cinema and regular fish and chips (yum). Family days out aren't usually cheap and I'm always looking for ways to make our money go further during day trips. Switching energy suppliers just didn't register as a way I could save money and have fun with the family too. I don't think you can put a price on memories with your children and days out are always going to be the place I choose to spend my spare or extra cash. Check how much money you could save by switching energy tariffs with E.On here and let me know in the comments what you'd spend the extra money on. It is so worth doing checks like this - I had got into the habit and have slipped out, so definitely worth making sure we've still got a good deal. I can think of so many things I'd spend £120 on (or £200!). Travel normally tops my list, but I need a new camera bag and strap, or perhaps a lens for me. £120 is not to be sniffed at! That's a good saving there. I'm about to move house and will be pricing up to check out the best providers. Thanks for the link! I so need to do this - we're one of those households that never changes who we get all our utilities from because it seems like such a hassle!